All kids benefit from exercise and physical activity but parents of special needs kids may find it challenging to include healthy activity into the lives of their children. While medical or behavioural concerns can make it difficult for some kids to participate along with siblings and peers, parents must do all that they can to make fitness a priority for all of their children. Even kids with medical limitations are likely able to participate in some form of exercise, so parents should begin their search for appropriate activities by scheduling a thorough check up for their child. Once a determination has been made as to what types of sports or exercises are off limits, parents can work with their child’s doctor and if applicable, physical therapist, to formulate a fitness plan designed to maximise the child’s individual abilities. People are social creatures and most folks are more likely to enjoy a sport or activity when they play along with others. Kids with special needs are first and foremost kids and their need for socialisation is not diminished by their other limitations. Parents can look for groups that their children can join, encouraging even the most resistant child to take an interest in exercise. Checking with school officials may help parents to locate organised groups specialising in activities for special needs kids. If none currently exist locally, parents may want to consider heading up an effort to begin one. Movement offers numerous benefits, not only physical but emotional, as well. Kids who feel “different” from their peers may struggle with self-esteem and confidence issues, so focusing on their abilities rather than their limitations can help them to feel better about themselves, important for all children (and big people!). Most kids, even those with considerable restrictions, can participate in some type of physical activity. For example, kids with Juvenile Arthritis (JA) suffer from painful joints and can sometimes have very limited mobility. Despite their discomfort, it is vital for kids with JA to move or their condition will likely worsen, so rheumatologists often recommend swimming for their young JA patients. 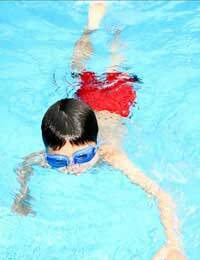 Swimming is also appealing for children with asthma, who sometimes find that certain types of exercise increases their chances of experiencing acute attacks. The warm, moist environment of an indoor swimming pool is conducive to easy breathing for asthmatic kids, preferable to any activities in dry, cold air. Children with behavioural disorders such as Attention Deficit Disorder (ADD) may benefit from individual activities such as martial arts to help them develop self-control and focus. Team sports are fine, too, but several of the symptoms of ADD, such as hyperactivity, distractibility, and impulsiveness may make it difficult for kids to stay on task and consistently adhere to rules. Over-stimulation can pose problems for many kids with ADD and other behavioural disorders, so parents should work with their children’s doctors in deciding on activities that offer the most benefit for kids and which medications, if any, may help their children to develop the focus necessary for sport participation. Parents of special needs kids are usually very aware of their own children’s strengths, giving them insight to choosing activities that would be a good fit for their children. All people, kids included, are made up of far more than their possible limitations. All kids have abilities, all kids have needs. While it can be frustrating at times for parents of kids with special needs to convince the rest of the world that their children are not all that much different from “healthy” kids, the fact remains that their children have not only the need for exercise, but also for acceptance, socialisation, and the development of self that is a normal part of childhood. Exercise and participation in sports can help kids to reach their maximum potential in a number of ways – which is vital for kids of all levels of ability.